39steps was appointed to create a fresh brand identity for new vegan café bar, Thrive. 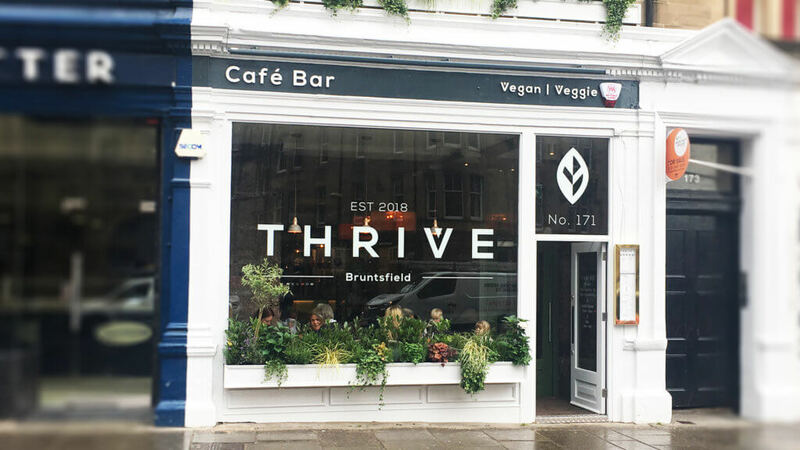 There's been a surge of interest in vegan and veggie fare, and Thrive makes this end of the culinary spectrum accessible to those who might not have tried it before, while being a new go-to eatery for the city's vegan and veggies. Of course, we just HAD to try it out, all in the name of research, y'understand. Team39 visited Thrive last week to taste their stylish lunch courses. I must say, we enjoyed our healthy and hearty lunch a lot! We were all delighted (even the carnivorous Steven) by how flavoursome their vegan dishes were and left absolutely stuffed. "Our immediate impression of Thrive, walking in, was the buzz of activity during a rather busy lunch service. Interior design was modern, fresh, and rendered in a variety of natural materials, from brick and wood to natural-fibre wall finishes, including a display of moss. Looking through the menu of this new Edinburgh vegan & veggie bar, various things caught our eye. Particularly the assortment of burgers, some with exotic ingredients — including jackfruit! Between the four of us, we managed to scoff (in addition to our excellent starters) three burgers and a bowl of ramen (ginger and soy broth, of course). Posh fries were the perfect accompaniment to our meals, which were all super tasty and well-seasoned. Because we were feeling especially proud of our health kick, we opted for dessert as well. A Thrive sundae, two chocolate mousses, and a cheesecake were soon dispatched, along with coffee and a quiet sense of environmentally-conscious achievement." It was great to see how closely the exterior signage followed our original design visuals! We love bringing a brand to life. Even better when you can eat the produce! So, i you're looking for a new place to go eat and enjoy a decent beer, we can heartily recommend Thrive.